A wide variety of disturbed habitats. Moist to dry. 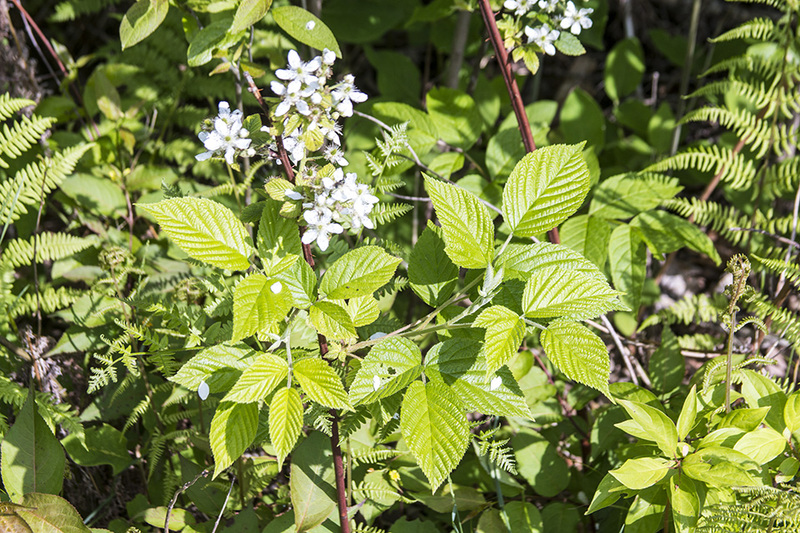 Mostly woodland edges in partial shade, but also in woods in dense shade and prairie edges in full sun. Mostly sandy soil but also loamy soil. 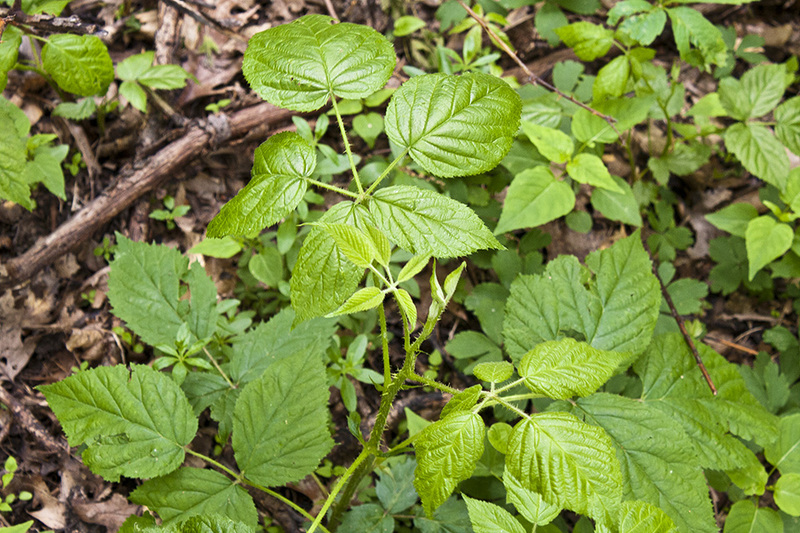 This is a 2′ to 7′ tall, erect, perennial bramble that rises from a taproot. It often forms loose colonies. 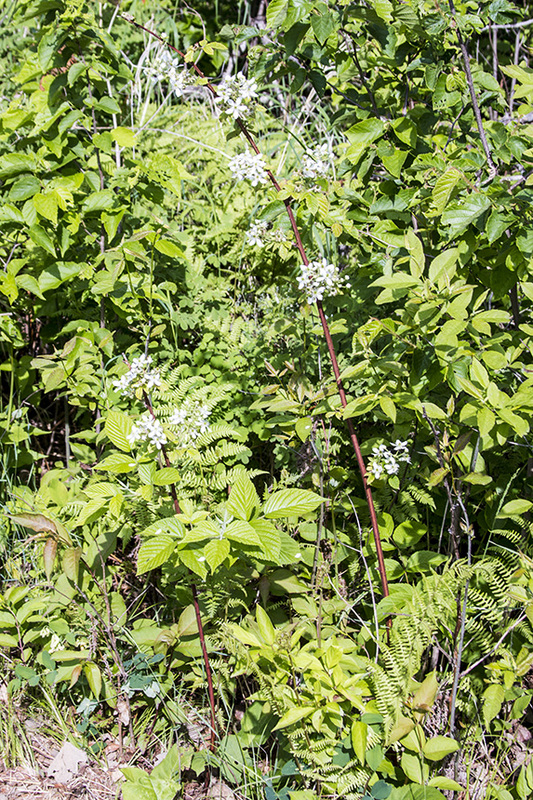 It is the most widespread and often commonest tall blackberry in Minnesota. A series of biennial stems are sent up from a perennial base. In the first year the stems do not flower and are known as primocanes. Primocanes are semi-erect, unbranched, up to 12′ long, and deep green with a reddish or brownish tinge. They have vertical grooves giving them an angled appearance. They have scattered prickles and are usually hairless but occasionally have scattered glandular hairs near the tip. 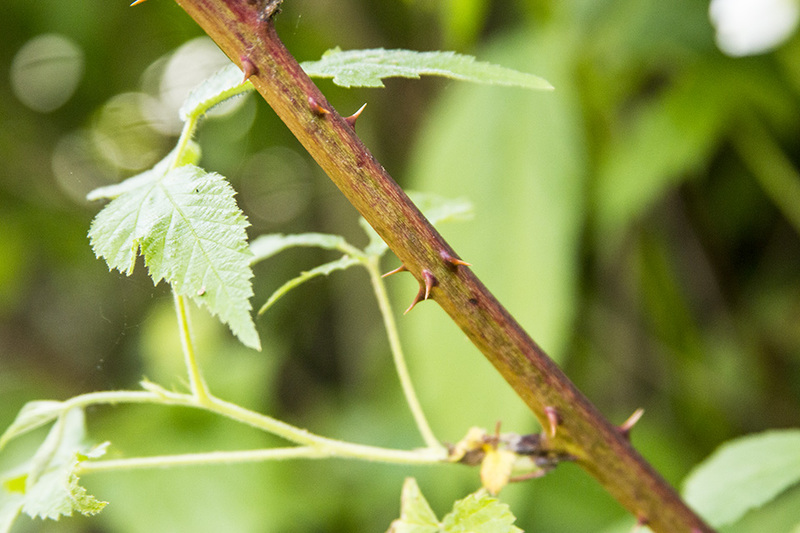 The prickles are straight or nearly straight, up to ⅜″ long, have a broad base, and have a sharp tip that can easily tear skin. Second year stems are known as floricanes. Floricanes are arching and reddish-green. They have vertical grooves giving them an angled appearance. They have scattered prickles and are hairless or have appressed hairs. They do not get any longer but produce short lateral branches with a few leaves and a terminal flower or cluster of flowers. They are not glaucous and do not reroot at the tip. 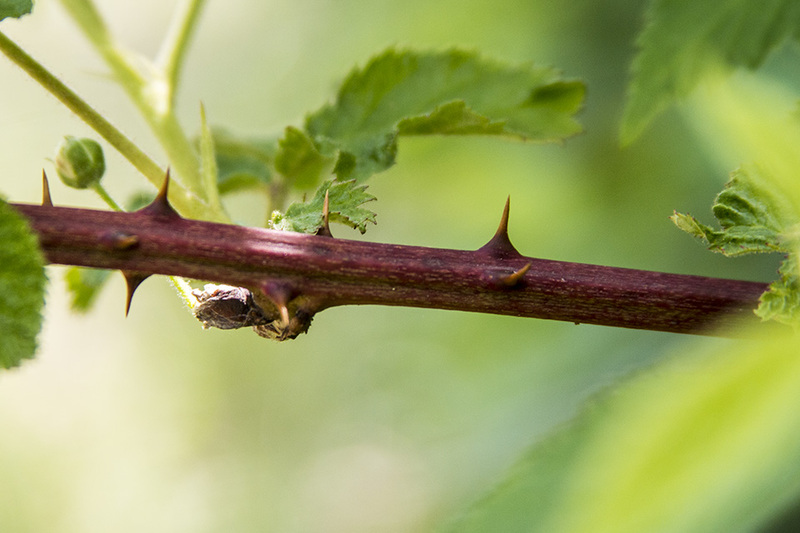 The prickles are straight or slightly hooked, up to ⅜″ long, have a broad base, and have a sharp tip that can easily tear skin. The leaves are alternate and deciduous. Primocane leaves are typically palmately divided into 5 leaflets, rarely 3 leaflets. At the base of each leaf stalk is a leaf-like appendage (stipule) that is linear and ¼″ to ⅝″ long, though usually no more than ⅜″ long. The terminal leaflet is egg-shaped to elliptical, 3¼″ to 5¼″ long, and 1½″ to 3½″ wide. It tapers to a long point at the tip with concave sides along the tip. It may be rounded, heart-shaped, or tapered at the base. The upper surface is thinly hairy. The lower surface is velvety-hairy. The margin has fine, sharp, forward-pointing teeth. It is on a long leaflet stalk. The lateral leaflets are similar but smaller. The 2 adjacent lateral leaflets are on shorter stalks, the remaining 2 leaflets are on even shorter stalks. The leaflets are no more than twice as long as they are wide. Floricane leaves are similar to primocane leaves but are typically divided into 3 leaflets, not 5. 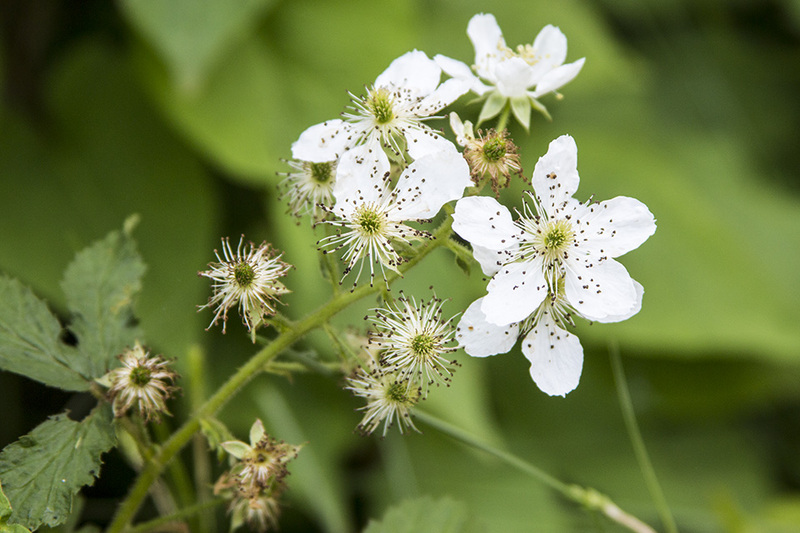 The inflorescence is an unbranched, elongated cluster (raceme) with 7 to 25, typically 9 to 14, stalked flowers. It is cylinder-shaped, 3⅛″ to 8⅝″ long, 1⅛″ to 2¾″ wide, much longer than wide, and extends well beyond the leaves. The stalk of the cluster (peduncle) and the stalks of the individual flowers (pedicels) have numerous conspicuously gland-tipped hairs. 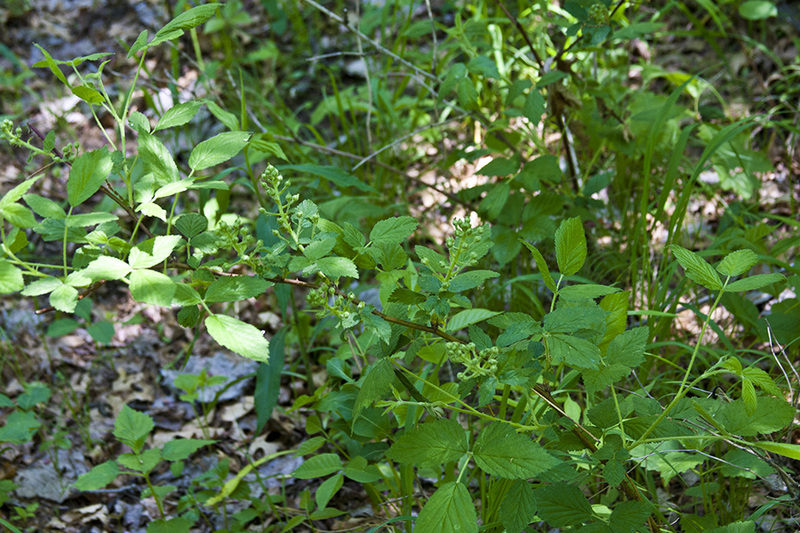 The flowers are 1″ to 1⅞″ across. 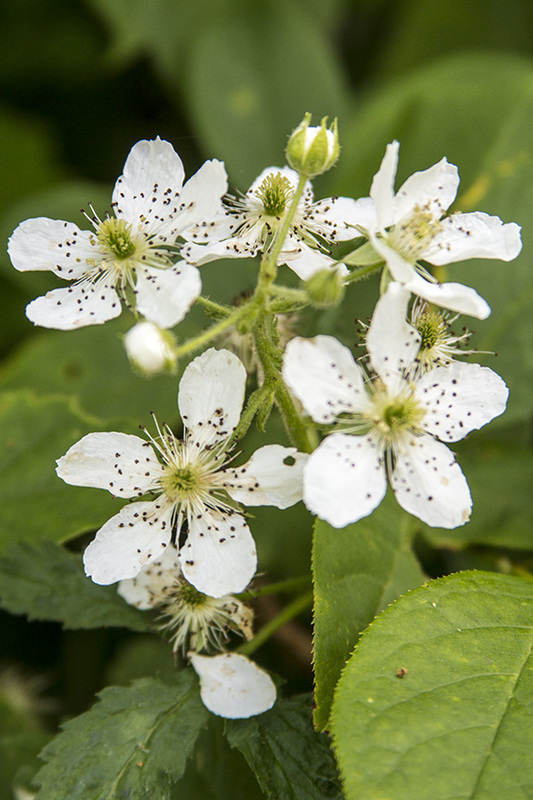 There are 5 green, triangular-shaped sepals, 5 white, elliptical to egg-shaped petals, and many stamens. The petals are longer than the sepals. There is little or no fragrance. The fruit is a juicy, short, cylinder-shaped, 5 ⁄16″ to ⅝″ long, 5 ⁄16″ to 11 ⁄16″ wide aggregate of multiple drupelets. It is initially white or green, later turning red, eventually turning almost black when it ripens. It matures late July to early September. When the fruit is picked it does not separate easily from its core. 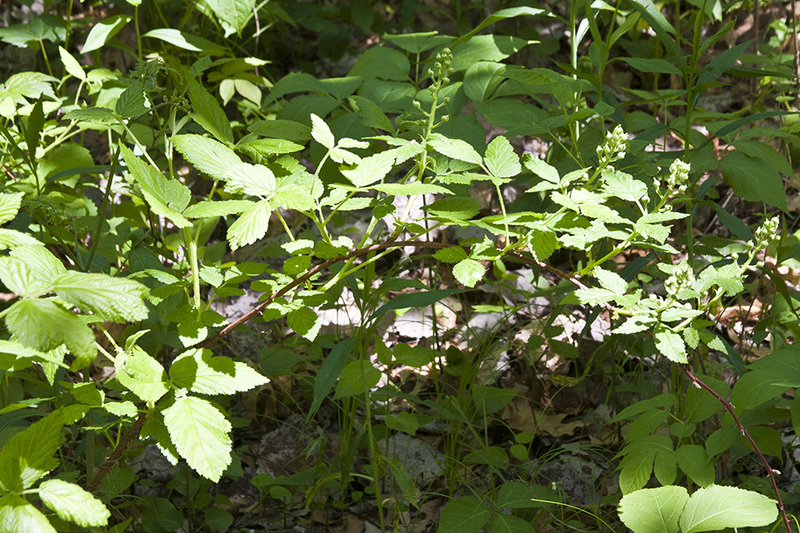 Black raspberry (Rubus occidentalis) stems are round, not grooved or angled. The leaf stalks are hairless. The inflorescence is a dense, flat-topped or convex cluster of 3 to 7 flowers. The stalks of the individual flowers have some fine hairs but no glandular hairs. 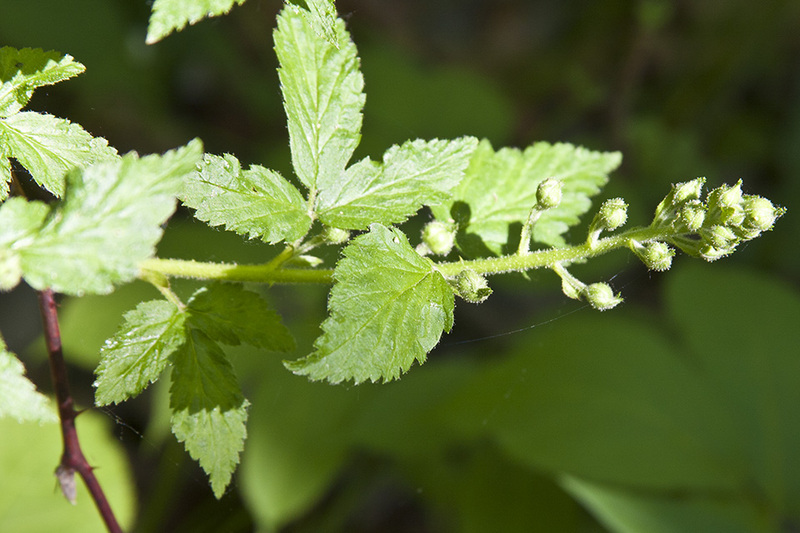 Oldfield blackberry (Rubus alumnus) inflorescence is 2⅜″ to 4″ wide. The sepals are longer. Plains blackberry (Rubus ablatus) peduncles and pedicels have dense, non-glandular hairs but have no glandular-tipped hairs. 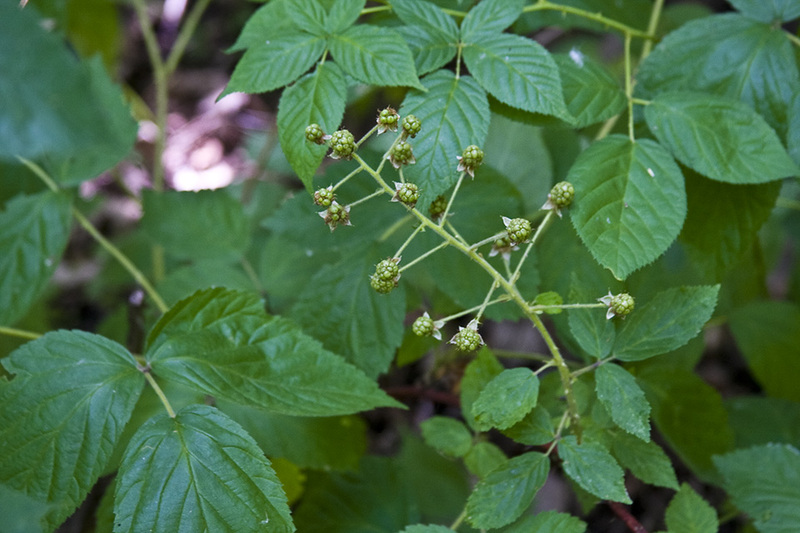 This is the most common tall blackberry in Minnesota. 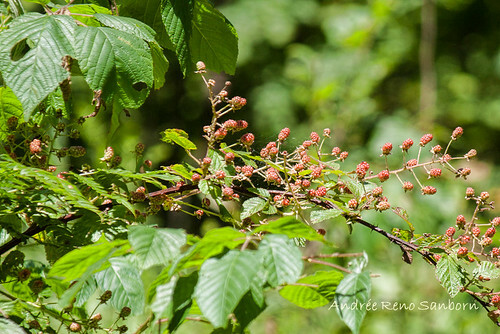 A compound fruit consisting of many separate individual fruits derived from separate ovaries in a single flower, like a raspberry or blackberry. 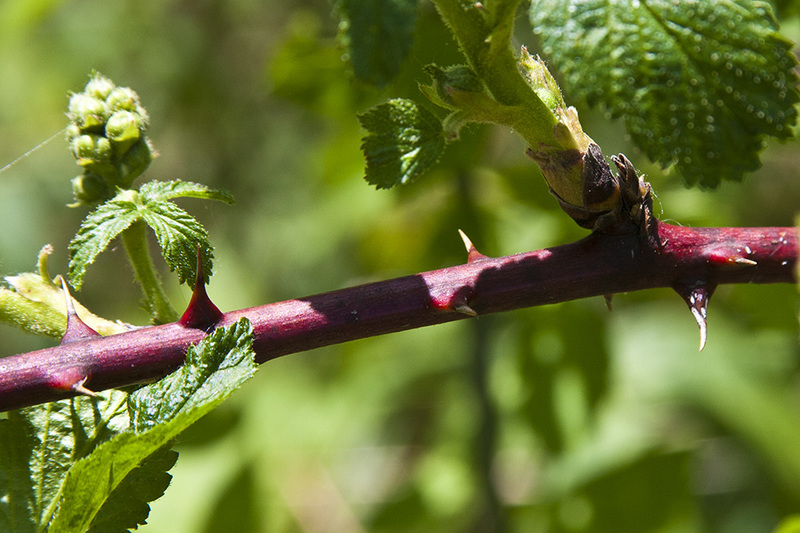 Thorny plants in the genus Rubus, including blackberry, dewberry, and raspberry. 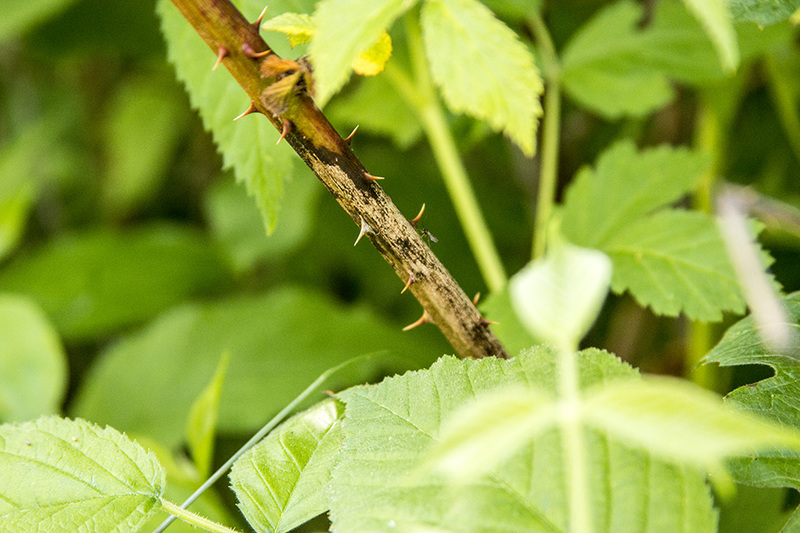 A two year old cane of a raspberry or blackberry that bears fruit and then dies. 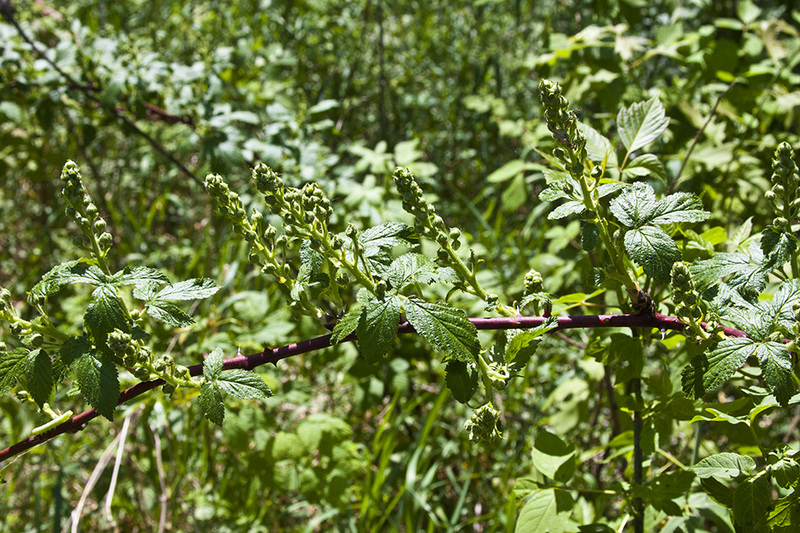 The first year cane of a raspberry or blackberry; it is usually unbranched and normally does not flower.